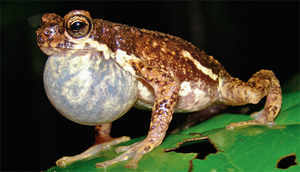 Bangalore – The Malabar Tree Toad is a small-sized toad (length 40 mm). As part of the citizen science programme launched by Bengaluru based Gubbi Labs, this monsoon will be utilsed to map the malabar tree toad (Pedostibes tuberculosus) an endemic toad to the Western Ghats. This species is known to live in tree habitats, but adults are found among leaf litter, climbing into trees at night. Canadian softwood lumber prices have fallen substantially in the past nine months, but that long, steady decline should end soon, according to industry analyst Hakan Ekstrom. The president of Seattle-based Wood Resources International said early signs of a resurgent US housing market should boost the demand for Canadian wood. “We probably reached the bottom on prices two weeks ago and can expect them to start moving up now,” he said. Mr Ekstrom noted approved US building permits last month increased by nearly 12% to an annual rate of 1.28 million housing units, the highest level since August 2007. Western Forest Products is banking on future business and $30 million to upgrade its mills in Nanaimo, Ladysmith and Chemainus. Company executives and B.C. Premier Christy Clark made the announcement June 11 at Western Forest Products’ Duke Point mill. The investment is part of the company’s $125-million capital strategic investment program, announced in 2013, to remain competitive and help it gain access to new markets. “Our strategy is to invest in the mills, make them extremely efficient, and then add more hours to our production facilities and that’s where we’ll see the job increase,” said Don Demens, Western Forest Products president and chief executive officer. Port Alberni Mayor Mike Ruttan says the amount of raw logs leaving his city’s port is growing exponentially and he wants some answers. He adds one in seven raw logs leaving Canada is leaving from Port Alberni. “We get concerned because we think potentially those are jobs, potentially that’s income for the Province, income for people who live in the City of Port Alberni,” Ruttan told CHEK News. Raw unmanufactured logs have filled 25 ships heading to foreign ports, mainly China this year, on target to match last year’s 53 vessels, but so far in 2015 only four ships have left with lumber processed in Port Alberni. Maine-based wood broker Andrew West prognosticated on future markets for wood products during the Federation of Nova Scotia Woodland Owners’ annual meeting in Truro on June 6. …West defended the much-maligned Northern Pulp in Pictou County. 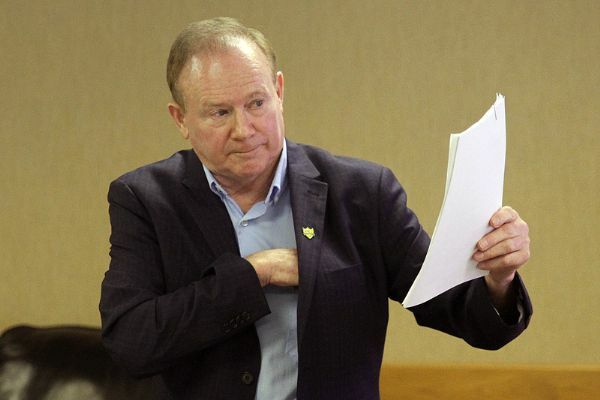 “If we are hostile to Northern Pulp; the word will get around the world (that) Nova Scotians are business unfriendly.” Northern Pulp is needed, because without it log and pulp wood prices will decline, he insisted. “If Northern Pulp disappears; we are going to hurt badly because they handle a lot of low value wood chips, hard woods and poplar.” …West observed the top stumpage rate for pulp currently is $35 a tonne. Hardwood logs “are really good money” getting $1,200 per tonne. The U.S. government is investigating whether to impose trade sanctions on paper exports from the Maritimes because of industrial subsidies that producers receive from the New Brunswick and Nova Scotia governments. The U.S. International Trade Commission, in a preliminary ruling in April, said American paper manufacturers have been hurt by the low price of subsidized Canadian paper coming from J.D. 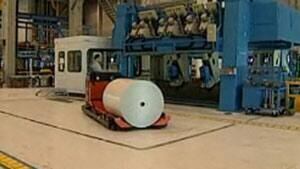 Irving Ltd. in Saint John and Port Hawkesbury Paper in Nova Scotia. It cited four provincial subsidies offered by New Brunswick. A spectacular waterfront fire Wednesday night lit up the skies along Thunder Bay’s north side. 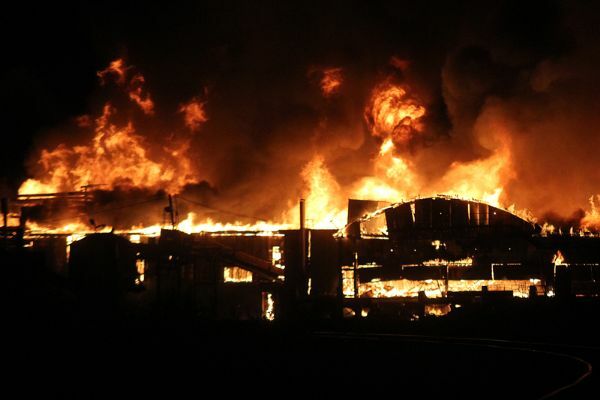 There was little firefighters could do after the massive blaze broke out in a vacant sawmill on the Buchanan-owned former Great West Timber property on Water Street. The entire structure was engulfed in flames, thick black smoke blanketing the rapidly darkening sky. The structure appeared to be lost, with firefighters left to keep the fire under control as the building burnt to the ground. …Great West Timber, through Buchanan, filed for bankruptcy protection four years ago, listing debts of $31 million and assets of just $8 million. When it closed the company employed 175 workers. Over the past week Columbia Falls has cranked up the debate: Can the city cater to industry and still tout itself as the Gateway to Glacier National Park? The city is willing to give it a shot. In a 6-0 vote Monday evening, the City Council voted to approve a zone change from light industrial to heavy industrial for 26 acres at the north end of town. The site is being developed by BID Group Properties of Vanderhoof, British Columbia, Canada and paves the way for expansion of SmartLam, a company that makes super-strong wood panels that are used in oil-rig pads and building construction. The SmartLam expansion would result in upwards of 50 high-paying jobs. 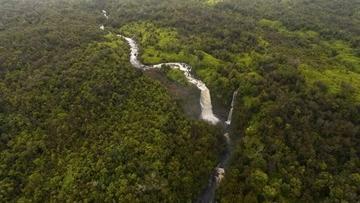 Finance Factors is selling its 13,130-acre Koa Forest on the Big Island of Hawaii, which is one of the single-largest privately-owned tracts of old growth native koa trees in existence, for $14 million, one of the brokerage firms marketing the sale confirmed to PBN Wednesday… In addition to residential estates, other potential uses for the Hilo koa forest include a trophy ranch, conservation or nature preserve, sustainable forest and timber production, agricultural development, eco-tourism and recreation, including equestrian, horseback trails and hiking. Longtime Longview businessman John Leber was critically injured when a wall made of 3,000-pound concrete blocks fell on him Wednesday morning at Swanson Bark and Wood Products. Leber, 70, was taken by Life Flight Helicopter to Southwest Medical Center in Vancouver, where he still was in critical condition Wednesday evening, according to the hospital. Tennant Way was closed briefly due to dust from the Life Flight helicopter as it took off from Swanson Bark, 240 Tennant Way, at about 9 a.m., according to Longview fire officials. 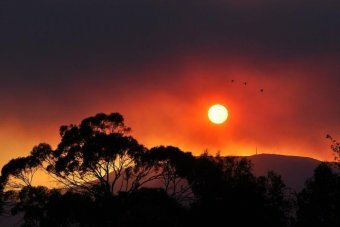 The State Government’s leading independent adviser on forestry believes Forestry Tasmania must be relieved of its firefighting duties, as another 100 positions are cut. Former Legislative Council president Sue Smith sits alongside Resources Minister Paul Harriss on the Ministerial Advisory Council on Forestry. She has previously called for the struggling Forestry Tasmania to be dismantled and its assets sold. Now she wants its firefighting responsibilities to be transferred to the Tasmania Fire Service (TFS). Minister for Primary Industries Nathan Guy must promptly question his staff – they appear to have no clue around the illegal export of swamp kauri, says New Zealand First. “Northland swamps are being drained and logs worth millions are being trucked away. Everyone but the Ministry says they are sent to China,” says Leader and Member of Parliament for Northland Rt Hon Winston Peters. “Is there some sort of massive cover up by the ministry and the sellers going on here? A Ministry spokesperson is categorically denying these logs are being exported. She says we are confused. 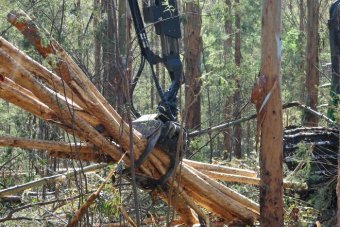 There are new allegations a Tasmanian forestry contractor who was paid millions to leave the industry may have breached the terms of his exit grant. 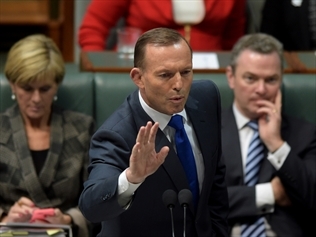 Contractors were eligible to receive up to $3 million to exit the industry for 10 years as part of $45 million made available by the Gillard Labor government in 2011. In 2013, 7.30 confronted north-west contractor David Scott who was paid $1.9 million to leave native forestry but instead exploited a loophole in the exit grant guidelines and started a new business called DTS Transport with his then 19-year-old son Dylan in charge. arguing the enterprise is untenable and should be shut down. International recycling giant Pratt is investing $400 million in the Midwest, more than half of which is bulking up its presence in Northwest Indiana. The Australia-based company just opened its 17th U.S. recycling center at 1 North Bridge St. in Gary. The 110,000-square-foot facility may be the largest recycling facility in Northwest Indiana and will save 1.5 million to 1.7 million trees a year, Pratt Recycling President Myles Cohen said. “That’s a lot of trees,” Cohen said. “That’s an entire forest.” Pratt plans to open three new recycling centers across the country this year, which Cohen said was really unusual in the industry. Investigation points to moisture-damaged wood as a prime cause of a deadly balcony collapse. A structural engineer says it’s “surprising and unexpected” that the wooden beams supporting the Berkeley, California, apartment balcony that collapsed and killed six people had deteriorated so much on a building less than a decade old. Darrick Hom, president of the Structural Engineers Association of Northern California, visited the site and said the wood was so decayed that the broken beams crumbled in the hands of investigators. He said Wednesday that the wood breaking off at their touch indicates major deterioration in the joists and wondered how that level of damage happened in just eight years… so investigators likely will look at how weatherproofing was carried out at Library Gardens apartments. Wood And Laminate Flooring Market Will Be Growing To $92.64 Billion by 2020: New Report By Grand View Research, Inc.
San Francisco, California — The global wood & laminate flooring market is expected to reach USD 92.64 billion by 2020, according to a new study by Grand View Research, Inc. Technological advancements have led to the development of new innovative products and do-it-yourself (DIY) installation techniques, which has substantially widened the scope across residential as well as commercial flooring applications. Increasing demand in the new construction and home improvement sectors is expected to be the key driving force for the wood & laminate flooring market over the forecast period. University of Canterbury civil engineer Professor Andy Buchanan has won three awards at the annual KiwiNet Research Commercialisation Awards in recognition of his innovative work into the development of a new system to construct multi-storey buildings using timber… Emeritus Professor Buchanan has undertaken pioneering research at UC which has led to the development of a new system of constructing earthquake-resistant, multi-storey buildings using post-tensioned structural timber, referred to as Pres-Lam (pre-stressed laminated timber). This research by Professor Buchanan and his team has initiated a step-change in the perception of structural timber, allowing direct competition with concrete and steel for large span and multi-store buildings. He is also involved in commercialising these timber building products with industry partners. 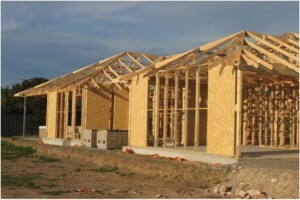 …From relatively stable ground in Madison, Wisconsin, researchers at the Forest Products Laboratory (FPL) are searching for better ways to build more resilient, taller, safer, and cost effective wooden structures for use in earthquake-prone areas of the nation. For the wood building community, the most viable tall building construction solution incorporates the use of cross-laminated timber (CLT). A CLT panel consists of multiple layers of kiln-dried lumber boards stacked in alternating directions, and bonded together with structural adhesives. The end result is an inexpensive, strong, solid, rectangular panel that can be used for building walls, floors or roofs. B.C. started the week with seven new wildfires on its map, for a total of 470 recorded so far in a hot start to the 2015 forest fire season. More than 60,000 hectares have burned so far, most of that from 150 fires in the Prince George fire centre region. An average season in B.C. records about 2,000 fires, half of them human-caused. Two new fires were reported on southeasterm Vancouver Island and a third at Nimpkish Lake on northern Vancouver Island this week. By Wednesday there were 14 new and active fires in the Kootenay and Okanagan regions. LUMBY – The B.C. Forest Service is assisting the Lumby Fire Department in trying to snuff out a small but stubborn fire in the north Okanagan. Flames broke out Tuesday evening on the east side of Camel’s Hump near Bear Valley Road. Smoke is very visible from in and around Lumby and Highway 6. The B.C. Forest Service says the fire in only spot size but very difficult to fight because of limited access. The area is steep and heavily forested. Crews are currently working on building access to the site and a rappel attack helicopter has been dispatched to the scene. I believe that a good elected person serves the interest of the citizens. He/she does not serve her/his self interest. He/she does not serve the interest of corporations. In my opinion City of Powell River Mayor Dave Formosa’s behaviour is bad related to the clear cut of our urban forest on Lot 450 [“City faces criticism from resident,” June 3]. According to Canadian laws, corporations are not citizens. They do not have the right to vote. If our elected servants actually represent the interests of corporations, then we need to step up and represent ourselves. This is what www.prforestcoalition.org is doing. …But I disagree with his behaviour related to the clear cut of our urban forest on Lot 450. 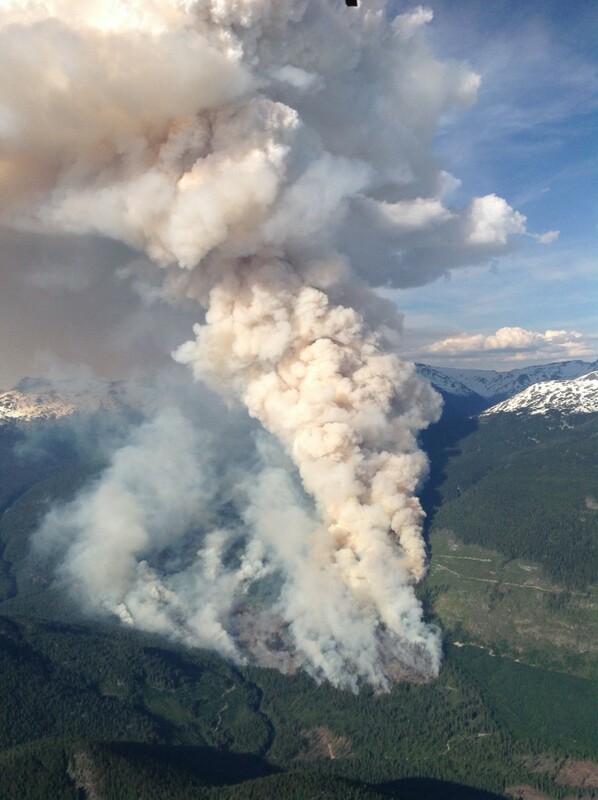 PEMBERTON – The Elaho wildfire, which is burning about 67 kilometres west of Pemberton, has now grown to 650 hectares. Crews are having a tough time fighting this fire because of the dry conditions, a weather inversion and the fuel types in the area. Two officers, 70 firefighters, five helicopters, two excavators and a water tender are on site and an Incident Management Team from the Wildfire Management Branch is also there. This fire is burning in steep, inaccessible terrain which is reducing visibility due to heavy smoke. *Near Anahim Flats in the Chilcotin *South of Mission Road near 150 Mile House She adds the fire danger rating is high throughout the Cariboo Fire Centre with “some pockets of extreme.” Epp notes mother nature may provide some help soon with “a return to cooler temperatures over the next few days” expected. Kenora Mayor Dave Canfield says it’s time the provincial and federal governments fought back against environmental groups opposed to forestry practices in northern Ontario and Quebec. Canfield, who heads the Northwestern Ontario Municipal Association, on Wednesday said groups like Greenpeace are damaging the regional economy, and without any basis in fact. He added forestry standards in the province are among the highest in the world, and while he can’t speak about what’s going on in South America or other places on the planet, he’s confident the boreal forest is in good hands. Western pine beetles’ infestation of ponderosa pine trees across the Boise National Forest has increased due to drought conditions. Aerial surveys conducted by the U.S. Forest Service showed a three-fold increase in ponderosa pine mortality with approximately 5,900 acres impacted. The majority of trees affected occurred west of High Valley, with pockets of infested trees also in the Sage Hen Reservoir area. Another area with an increase is Boise Basin in the vicinity of Placerville and Centerville. More ponderosa pine mortality is expected this year especially in areas of high tree density or with weakened trees due to dry conditions. NORTH BEND — The Coquille Indian Tribe hosted the 39th annual National Indian Timber Symposium last week, giving tribes from across the nation a chance to not only gather together but get a glimpse of life on the southern Oregon coast. The event at the Mill Casino-Hotel last week included presentations, panel discussions, workshops and tours related to natural resource management within the tribes. Some 400 attended. “This is the chance for all tribes to get together and talk about their successes and achievements and challenges,” said Coquille Indian Tribe Chairperson Brenda Meade. GRANGEVILLE, Idaho – An Idaho official is trying to garner support from counties in western states to legally challenge the government’s ownership of public lands. The Lewiston Tribune reports Idaho County Commission Chairman Jim Chmelik is traveling this week with the goal of getting 100 counties to sign on to support the Western Landmark Foundation. The foundation was formed in March with Chmelik as the registered agent. He says when 50 counties have signed up he’ll start asking supporters to contribute between $3,500 and $5,000 each toward a legal fund. ANCHORAGE, Alaska – Firefighters and equipment from the lower 48 states and Canada are arriving to help battle wildfires burning in the nation’s largest state. Weary firefighters welcomed the help as they struggled to keep up with two major fires threatening rural highway communities, even as lightning sparked nearly a dozen more blazes. Although firefighters are devoting most of their time and energy to a large fire in Willow, in the heart of sled dog country, and another on the Kenai Peninsula south of Anchorage, it’s important to attack the new, smaller fires quickly. Bill would help managers and forest cope with wildfire, U.S. Rep. Lummis says. New legislation co-sponsored by U.S. Rep. Cynthia Lummis, R-Wyo., would reduce the environmental review needed to approve forest thinning and logging projects intended to prevent wildfire. The Resilient Federal Forests Act, which passed the U.S. House Committee on Natural Resources on Thursday, would expedite the approval processes required by the National Environmental Policy Act, Lummis said. “The purpose is to increase forest health and increase the ability of trees to be more resilient when they’re fire prone,” the congresswoman said in an interview. Drought conditions in the Sierra Nevada are leading to bug infestations that are killing millions of trees, according to a University of California Cooperative Extension adviser. DAVIS, Calif. — Drought is taking a toll on California forest lands, weakening trees and making them more susceptible to deadly attacks from pests, according to a university study. U.S. Forest Service aerial monitoring surveys in 2015 showed a large increase in tree mortality in the southern Sierra Nevada, as an estimated 10 million dead trees were spotted in more than 4.1 million acres of public and private land, according to the University of California’s Division of Agriculture and Natural Resources. You might think you know what frogs sound like — until, that is, you hear the symphony of amphibians that fills the muggy night air at Nokuse Plantation, a nature preserve in the Florida Panhandle. There, about 100 miles east of Pensacola, a man named M.C. 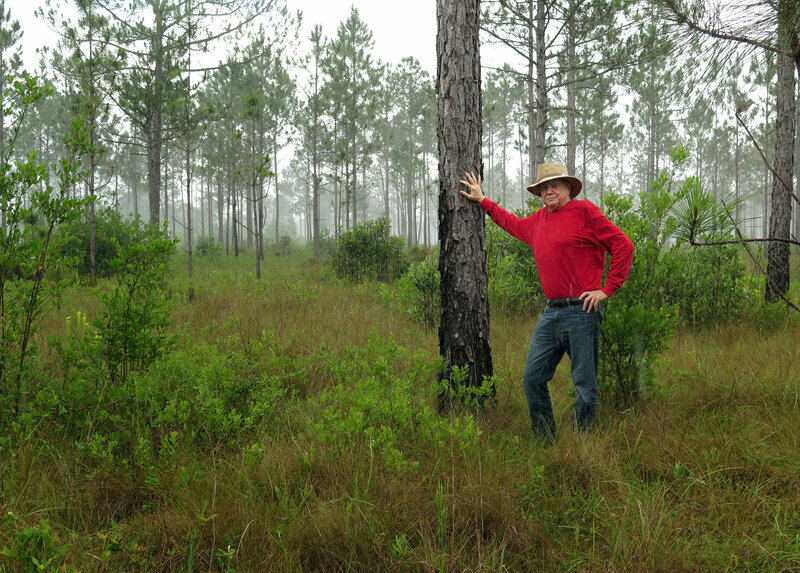 Davis has done something extraordinary: He has bought up tens of thousands of acres in the Florida sandhills and turned them into a unique, private preserve. In the largest block of privately owned conservation land in the southeastern U.S., Davis is restoring ecosystems that agriculture and timbering have destroyed. 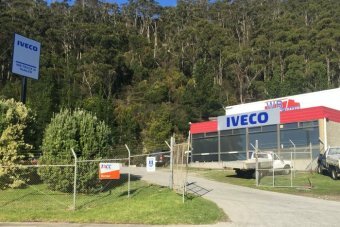 A document obtained under Right to Information laws shows Forestry Tasmania would have had to “temporarily cease operations” if the State Government had not permitted it to increase its borrowings. During estimates hearings at State Parliament last week, the Tasmanian Treasurer Peter Gutwein revealed he had extended the troubled company’s borrowing limit from $31 million to $41 million. The Government has written a “letter of comfort”, effectively going guarantor for the company’s debts. A new study says climate change could wipe out forests in the Great Yellowstone ecosystem in coming decades. The report “The Coming Climate: Ecological Impacts of Climate Change on Teton County” was commissioned by the Charture Institute and draws on previous scientific studies to make predictions about the environmental and economic impacts of climate change in Northwestern Wyoming. Corinna Riginos is an ecologist and co-author of the report. Riginos says less precipitation and warming temperatures in the area could increase the frequency and severity of forest fires. She says events the size of the massive 1988 Yellowstone forest fires could occur several times before 2050. By 2075, she says conditions for those kinds of fires could occur every year. It sounded like such a good idea. Europeans, looking for environmentally friendly ways to generate power, would rely on wood pellets to comply with new mandates to reduce carbon emissions. North Carolina, with its forests and available ports, would meet the demand. Good for the environment, good for the economy, right? Wrong. A recent investigation by the Washington Post shows this arrangement is far from “carbon-neutral.” The report, backed by data from an independent analysis, shows that cutting down hardwoods in North Carolina and Virginia to make these wood pellets produces 2.5 more times carbon pollution than continuing to burn coal for 40 years and more than three times the carbon pollution over 100 years. 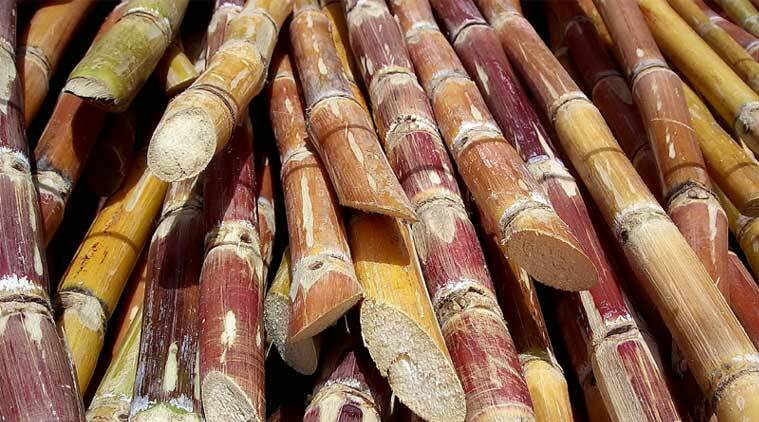 Rearchers, including those of Indian-origin, have developed a new method to produce ‘eco-friendly’ aviation fuel from sugarcane biomass that could lead to substantial cuts in greenhouse gas emissions. “We’ve combined chemical catalysis with life-cycle greenhouse gas modelling to create a new process for producing bio-based aviation fuel as well as automotive lubricant base oils,” said Alexis Bell, a chemical engineer with joint mappointments at Lawrence Berkeley National Laboratory and the University of California Berkeley. “The recyclable catalysts we developed are capable of converting sugarcane biomass into a new class of aviation fuel and lubricants with superior cold-flow properties, density and viscosity that could achieve net life-cycle greenhouse gas savings of up to 80-per cent,” Bell said.